Description This drawing shows the intersection of two streets. It might be used to explain a traffic accident. 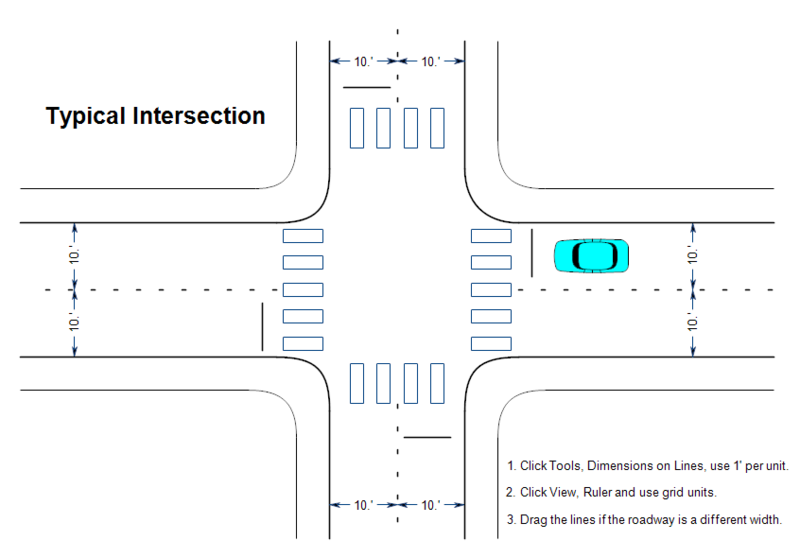 Drawings can also be used to suggest possible redesigns to the intersection. Drawing Instructions If you haven't already done so, first download the free trial version of RFFlow. It will allow you to open any drawing and make modifications. Once RFFlow is installed, you can open the above drawing in RFFlow by clicking on TypicalIntersection.flo. From there you can zoom in, change the text, change colors, print and fully customize this sample drawing. It is often easier to modify an existing drawing than to draw it from scratch. On the above drawing, each grid unit represents 1 foot. This is established by clicking on Tools, and Dimensions on Lines. To edit the text, you can either double-click or right-click and choose Edit Text from the menu that appears. For example, you can double-click on each 10' and change to the width of a lane on your road. You can move a line by dragging it or change its length by single clicking on it and dragging one of the handles. Green handles appear when you click on a shape, line or curve. Drag these handles to size the object. To change colors and other properties, right-click on the line or shape and select Properties in the menu. To duplicate a line or shape, right-click on it and choose Duplicate. To delete a shape or line, right-click on it and choose Delete. In general, you drag objects to move them, left-click to size them, and right-click to change their text or properties. To create this drawing without downloading it, run RFFlow and click the More Shapes button. Open the Transportation folder and click on the Roads stencil. Then click the Add Stencil button.